Hi, I am interested in your 1940 Chevrolet Master (stock #5103-CHA) listed on Autotrader for $29,995. I'd like to get more information about this vehicle and confirm its availability. Beneath the cool classic first impression is a true street machine. 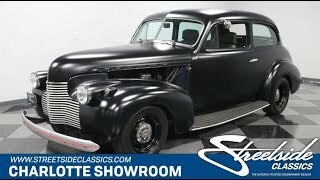 So dig into the details on this 1940 Chevrolet Master Deluxe, because youre going to find a freshly-built custom with V8 power, upgraded suspension, a custom A/C interior, and much more. At first glance, this might just seem like a very clean classic after all, theres less than 900 miles on the build. The matte black paint, black steel wheels, and painted silver grille/bumper package even capture the rationing attitude that was going on in the ramp-up for WWII. So this classic represents its era... but theres something much more going on. All these low-key elements are ideal for a street rod, too. And you start to see more of this with the halo headlights, LED taillights, and open side coves that let everyone see the V8 inside. When you open the door, you know this is a full custom machine. Plush gray bucket seats with cool ostrich pattern inserts offer terrific comfort. They really coordinate this package with the rear seats, side panels, dash, and even the custom cup holder center console. Its such a uniform look that even the piping in the seats matches the carpeting. Not only does this Chevy have room for everyone, but also theyre going to stay happy thanks to features like the AM/FM/CD stereo and cold R134a air conditioning. You get Chevys grippy NK4 steering wheel, a tilt column, and upgraded gauges. So yes, this is truly an easy/cool cruiser. The moment you look at the V8, you instantly know why its on display. Its a terrifically tidy setup where you can see classic Chevy orange radiating from within the darkness. Plus, there are plenty of polished components on the compressor, steel-braided hose, alternator, and Edelbrock valve covers. More than just look nice, this 350 cubic-inch V8 inhales deeply with an Edelbrock four-barrel carburetor. It exhales with a sweet rumble as shorty headers feed the Flowmaster H-pipe dual exhaust. It has easy driving features like a three-speed automatic transmission and power steering. Plus, youll see in the undercarriage photos a full Mustang II-style independent front end upgrade that now includes front disc brakes. The freshness of this build gives it an overall solid feeling on the road. Its impressive that such a unique, custom, and fresh build is available for such an obtainable price. So you know you need to hurry on this deal. Call now!